Well, to be honest, I didn’t think it was a stupid question when I’d asked it, either. After all, it’s one of the questions favored by trial lawyers around the world. 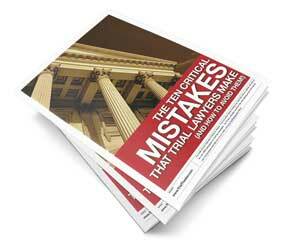 If there is a “Top Ten” list of questions asked by trial lawyers, “What happened next” is probably the #1 or #2 response. It’s one of those reliable questions you can pull from your trial toolkit and ask when your brain goes blank and you can’t think of anything else to ask. And it’s a powerful question, too. Even though it’s only three words long, it’s guaranteed to get a response. Yet, despite it’s popularity, “What happened next?” is one of the worst questions we can ask during direct examination. “What happened next?” is a lousy question because it doesn’t give the witness any guidance on how to answer your question. You may know where you’re headed with your questions, and you may know what you want him to say, but that doesn’t mean your witness knows what he’s supposed to say. Even if you’ve spent hours and hours preparing, you can’t assume that the witness knows what he’s supposed to say next. There are a few reasons why the witness probably doesn’t know where he’s supposed to go. The first reason is because he’s nervous and has probably forgotten most of your pre-trial instructions. You’re probably not nervous, because you work here in the courtroom everyday. But your witness doesn’t. The courtroom is a place that he tries to avoid, if possible. Even if he testifies on a regular basis, sitting in the witness stand and answering questions before a judge and jury is still a nerve wracking experience. That nervousness prevents him from thinking as clearly as possible, and improves the chances that he’ll misunderstand how he should respond to your question. The second reason why he probably doesn’t know how he should respond is because, unlike you, he doesn’t have any notes to help guide him. You’ve got a script (or at least an outline) that keeps you on track and allows you to easily move from topic to topic, but while your witness is in the witness stand, he’s not even allowed to use a rough outline. The final reason why your witness isn’t responding as expected is because he can’t read your mind. In your head, you know exactly where your questions are headed, and you know what answers you expect. But since your witness can’t read your thoughts, there’s a good chance that he won’t know which “next” event you’re referring to. If you want witnesses to give you the best possible answers, you need to give them some type of guidance. That doesn’t mean you should ask them leading questions. The witness doesn’t need to be told word-for-word what to say. He just needs a little guidance about which direction his testimony should go. That’s why “What happened next?” is such a terrible question. It doesn’t give the witness any guidance at all. When you ask the witness to tell you what happened next, you’re not doing anything to narrow his range of responses. Technically, there may have been a million different things that happened “next.” Which one do you want the witness to talk about? See how the questions direct the witness towards a limited area? By narrowing your witness’s range of responses, you make it easier for him to answer. Focusing him towards a limited area lets him know where you’re headed with your questions, and allows him to give you much better answers. Rather than asking “What happened next,” give your witness a little bit of guidance, and he’ll testify better than he ever has before. You are a very thought provoking blogger. This is a terrific article. I have to know, why the hell was there a motion for a mistrial? I do not understand the simplicity in which defendant was let off of the hook. I am preparing my direct examination as we speak for class and I am really interested in how the officer’s testimony lost the case. I am even a little envious of the Attorney in that position. Whether it was intentional or not. During my first DUI trial, 2 weeks ago, I asked the DUI officer “what happened next.” We had just gone through implied consent and how the defendant refused to submit to a breath test after being warned. So when I asked the officer what happened next he said, ” I read Miranda and the defendant refused to answer questions.” MOTION FOR MISTRIAL. I was completley devastated. I took everything out of me to hold it together. I WILL NEVER ASK THAT QUESTION AGAIN!